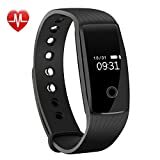 【Fitness Tracker with Heart Rate】This smart bracelet can track your heart rate and all-day activities. It can display steps taken, distance travelled, calorie burned, etc. You can also check your latest history sports data by long pressing the side button for 2 seconds. Let these activity data be your guide. 【Calls/SMS/SNS/Sedentary Alert】 It will vibrate to alert you if your phone receives a phone call, SMS text and SNS messages including Facebook, Twitter, WhatsApp, Linkedin, Messenger,etc. Simply connect the bracelet to your smart phone via Bluetooth and set in the app, you will never miss a call and a message. Open the “Sedentary Alert” function in the app, it will vibrate to remind you to move if you stay at your seat for a long time. 【Remote Control Phone Camera】Use this function for selfie or group photos with a better pose or photo sight. Open the camera function in the app, you can use this smart wristband to easily control your phone camera. Simply rotate your wrist quickly to snap a photo. 【Quick Charge】Built-in low-power-consumption Bluetooth chip, sensor and 75mAh rechargeable battery, it needs only about 1 hour to be full charged and the standby time can be up to 5-7 days with full power. Simply insert it into USB port of computer or portable power bank. 【Wider Compatibility】App supports most smart phones with Bluetooth 4.0 or above(not for tablet). Support system: iOS 7.1 like iPhone 7/6/6s/6s Plus/5/SE or above(not for iPad), Android 4.4 like Samsung S8/S7/S6 Note 5/4 or above.